Gsinth 2, available together with Gsinth 1, was created and maintained by Graham Yeadon. 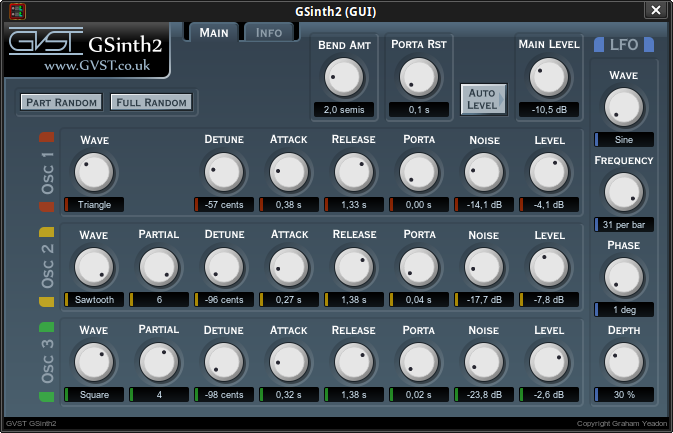 Gsinth 2 is a cross-platform, 3-oscillator realtime VST software audio synthesizer ported to the linux platform. It is available as part of a package that includes a host of plugin effects as well (Gchorus and Gdelay were also used in the demos above). The entire package is available at the link below. Gsinth 2 differs from Gsinth 1 in that it includes not just sine waves, but also triangle, saw and square waves, as well as noise. A randomizer button is also available. Holding down the Shift key while randomizing will produce less extreme randomizations. There is also a Porta Reset dial, which controls the amount of time passed before retriggering. Lastly, an Auto-Level button is available, which serves to limit the main audio level to -3 dB. A few presets: Patches 01 The presets in this tarball were made running Gsinth 2 in the Carla Plugin manager, available in the KXStudio repositories. You will need Carla in order to be able to use them.